Even Dr. Wily answers to him. "I think you'll find that I'm in charge everywhere." The Man is a much less specific villain than The Syndicate or the Ancient Conspiracy, a personification of establishment itself, even if no one person or organization makes up that establishment. You've heard of him. He controls everything. Emperors, ancient conspiracies, gods, Absurdly Powerful Student Councils. They are all under his control. It can overlap with The Man Is Keeping Us Down and The Man Is Sticking It to the Man. Rarely involves The Man Behind the Man, unless the said person was made explictly clear to be the one who created the personification of establishment on the first place. The second issue of the Black Dynamite comic sees the titular hero taken in and offered a job by a bald (white) individual who, when asked who he was, answered "I am The Man". More specifically, The Man is the representative of the Illuminati, the (predominantly white) elite who secretly run the world. Used as a Black Comedy joke in Don't Be a Menace to South Central While Drinking Your Juice in the Hood. Jack Black's character in School of Rock rambles about The Man, prompting the kids to stick it to The Man. This leads to one of the kids telling the principal that "[she's] the Man." She thinks it's a compliment. The unseen Man in The Friends of Eddie Coyle, who personally orders the hit on the titular character. Eddie from Super Fly blames The Man for the existence of the drug trade that he and Priest are enmeshed in. "I know it's a rotten game. It's the only one The Man left us to play." The infamous "Big Brother" in George Orwell's Nineteen Eighty-Four. One Flew Over the Cuckoo's Nest describes a mechanised Mind-Control Conspiracy called the "Combine" to represent society's ubiquitous systems of conformity and control. The Combine's chief representative in the story is not a man but a woman — specifically, Big Nurse Ratched. Walker from Simon R. Green's Nightside books. At the end of The Good, the Bad and the Uncanny, John Taylor is maneuvered into taking his place. Randall Flagg is the source of all evil in the books by Stephen King. Any truly evil enterprise is linked to him in some way. Present in Unbuilt Trope form in 1922 novel One of Ours, as Claude's progressive friend Gladys ruminates on the sort of people who run the world. "Left a good job in the city, workin' for The Man every night and day..."
Shut up, you're talking too much! In Living Color! : Homey the Clown pretended to sell out just to get close to the Man and whack him on the head. MADtv once featured a PSA from The Man. Dave Gorman's documentary America Unchained was all about trying to tour America whilst avoiding what was called (at least in the book of the series) "The Man(TM)"- that being the big chains of shops, gas stations, motels and such, in favour of smaller, independent "mom and pop" businesses which were becoming harder to find. Angel: The demonic law firm Wolfram & Hart is the embodiment of the Establishment, and there are many examples of "The Man" among it and its clientele. In season five, the main characters take over the firm with the goal of reforming it, thus becoming "The Man" themselves. After realizing that's impossible to reform the Establishment, they epicly stick it to The Senior Partners (The Man Behind the Man, except demons) by assassinating a shadowy council of W&H's top clients and briefly postponing the Apocalypse. In the Shadowfist CCG, The Man was the leader of The Ascended (and thus, pretty much ruled the world) in the 1970s. Spirit of '77: This being a game about The '70s, all characters have a common goal of sticking it to him. "The Man" turns up in Kingdom of Loathing, as the leader of the Frat Orcs during the Mysterious Island War quest. The Illusive Man in Mass Effect 2, played by Martin Sheen. He communicates with Shepard to provide them with info via hologram and is always shown in dim light while smoking a cigarette and/or drinking. His name and backstory are only explained in a tie-in comic; none of the characters, including his right-hand-woman Miranda, have any idea where he came from or how he got where he is. All they know is that he has staggering resources and big, big plans for his species. The Half-Life character "G-Man" is always lurking around in the backscenes, armed with a briefcase that could contain anything, dressed in a perfectly anonymous suit. He may take a train to the opposite of your direction, he will still be at your destination before you. "The Manh " is a possible name for a general of Zhuang culture in Victoria 2. That Man is a main antagonist of the Guilty Gear franchise. Louder With Crowder: Parodied in a sketch where Crowder shows the Founding Fathers of the United States as a literal meeting of The Patriarchy getting together to find new ways to oppress women. 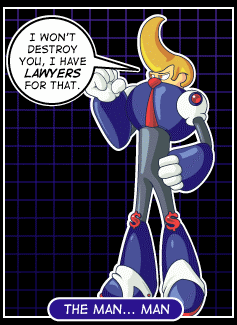 Used as a "Rejected Mega Man Villain" in the webcomic Dueling Analogs, as seen in the pic. Lil' E terms Jesus this. Percy thinks Pooch is carrying a tracking device for him. Monique characterizes Satan as him. King Zahard from Tower of God. In Tigerlily Jones's personal reality in Skin Horse, the eponymous "black ops social services" organisation is The Man. Despite their leader, a female uplifted Spitz, insisting "I am not The Man! For several reasons!" Tigerlily: Hiding himself inside a cute dog. That's such a "The Man" thing to do. Parodied in an episode of The Amazing World of Gumball where Gumball mentions The Man and Idaho is confused as to who he's talking about saying "What man?" and "Who's that?"